Sunday March 2nd 1879. It was snowing this morning when we got up but it soon stopped. Rob and I went to the funeral of Mr Layton at the Methodist church went in the cutter I guess the last sleighing of the season. I read in the afternoon and evening. It thawed most of the snow of today. 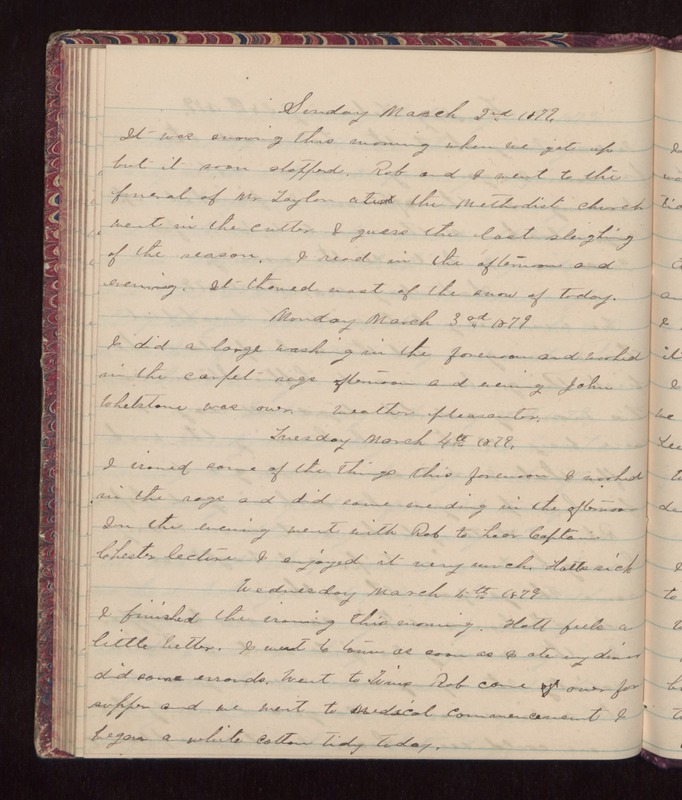 Monday March 3rd 1879 I did a large washing in the forenoon and worked in the carpet rags afternoon and evening John Whetstone was over Weather pleasanter. Tuesday March 4th 1879. I ironed some of the things this forenoon I worked in the rags and did some mending in the afternoon In the evening went with Rob to hear Captain Chester lecture I enjoyed it very much. Hatts sick Wednesday March 6th 1879 I finished the ironing this evening. Hatt feels a little better. I went to town as soon as I ate my dinner did some errands. Went to Wins Rob came over for supper and we went to Medical Commencement I began a white cotton tidy today.